Dr. J (Julius Erving) autographed NJ Nets Jersey. Jersey is an Adidas size XL Length +2. 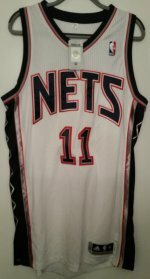 All autographs are 100% guaranteed and this jersey comes with a certificate of authenticity from the NJ Nets organization.